This discovery by researchers Ping Yuan Hsu and Liehui Ge, both UA polymer science graduate students; Alyssa Stark, UA integrated bioscience graduate student; Xiaopeng Li, chemistry research scientist; Chrys Wesdemiotis, distinguished professor ofchemistry; Peter Niewiarowski, interim director, UA Integrated Bioscience, Ph.D. Program; and Ali Dhinojwala, chair of the UA Department of Polymer Science, is published in Interface, the Journal of the Royal Society under the title: Direct evidence of phospholipids in gecko footprints and spatulasubstrate contact interface detected using surface-sensitive spectroscopy. Observers ranging from Aristotle to young children have long marvelled at the ability of geckos to cling to walls and ceilings. Detailed studies have revealed that geckos are sticky without the use of glue or suction devices. Instead, a gecko's stickiness derives from van der Waals interactions between proteinaceous hairs called setae and substrate. 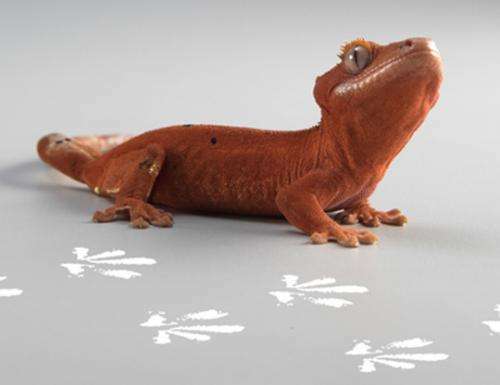 Here, we present surprising evidence that although geckos do not use glue, a residue is transferred on surfaces as they walkgeckos leave footprints. Using matrix-free nano-assisted laser desorption-ionization mass spectrometry, we identified the residue as phospholipids with phosphocholine head groups. Moreover, interface-sensitive sum-frequency generation spectroscopy revealed predominantly hydrophobic methyl and methylene groups and the complete absence of water at the contact interface between a gecko toe pad and the substrate. The presence of lipids has never been considered in current models of gecko adhesion. Our analysis of gecko footprints and the toe padsubstrate interface has significant consequences for models of gecko adhesion and by extension, the design of synthetic mimics.